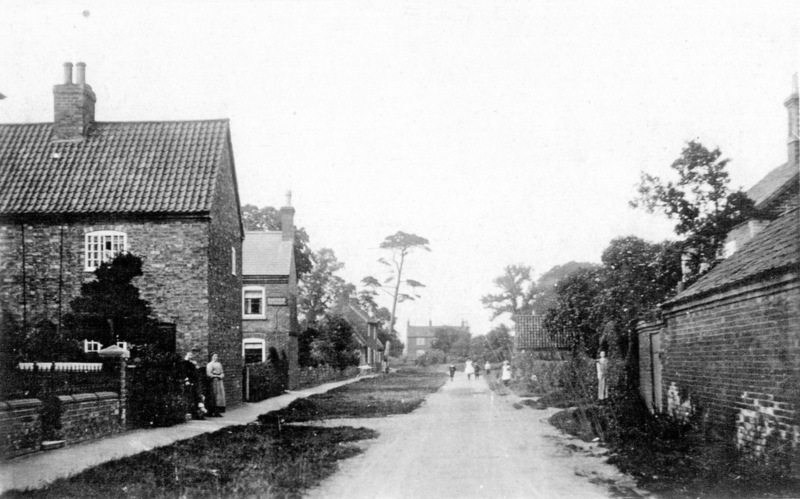 Albert Street, Bottesford early 1900s. By WW1 Bert and Eliza Skinner were living in the first cottage on the left. 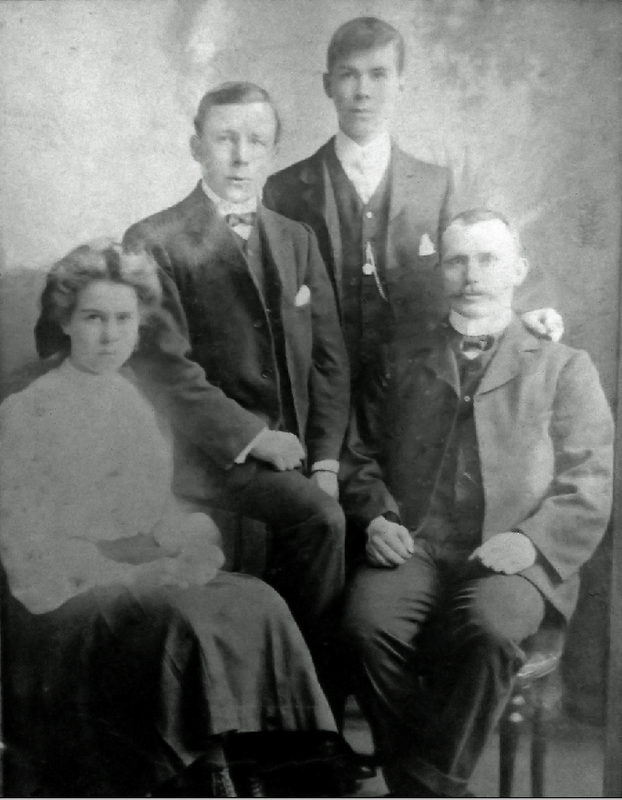 Family Portrait of the Skinner family showing left to right - Doris, Bert, Ernest and their father James. James Herbert George Skinner, born in 1886, was the eldest son of James and Susan Skinner. His father was born in 1864 in Blackfriars and his mother at Eydon, Northants in 1866. James Herbert was known to the family as Bert. The family lived in Finchley, London where his father worked as a journeyman butcher before becoming a painter. Bert had two younger siblings, Ernest and Doris. Sadly their mother died of peritonitis in 1892 when Bert was 6 years old. With three young children to look after, Susan’s sister Mary Hemmings took on the role of surrogate mother and housekeeper. By 1901 Bert, age 15, was working as a gardener; Ernest and Doris were still at school. Sometime after 1901 Bert’s father agreed to move up to Bingham in Nottinghamshire to work in partnership with the husband of a cousin. By the 1911 Census the Skinner family was living in the Market Place, Bingham. However, by the summer of 1910 James had married Eliza Thornton. Eliza was born in 1884 at Aslockton, a village nearby to Bingham. James Skinner continued to reside in Bingham working as a painter and decorator with his two younger children and their Aunt Mary. 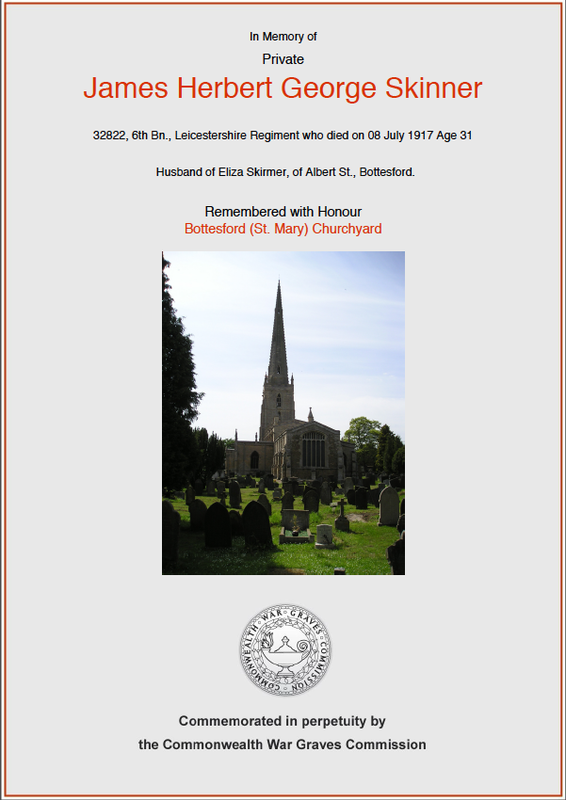 After their marriage Bert and Eliza Skinner moved to Bottesford. 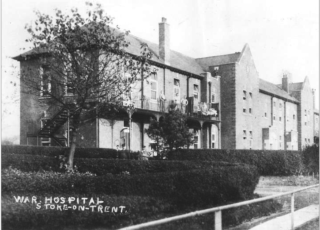 They lived on Albert Street and Bert worked as the local representative of the Prudential Insurance Company. He became a member of the church choir and by the time of his death in July 1917 Eliza had given birth to Denis. No records survive giving full details of James Herbert George Skinner’s 1st World War service. He served with the 6th (Service) Battalion, Leicestershire Regiment as a Private, Service Number 32820. His Medal Index Card does not list the 14-15 Star therefore he would not have seen active service prior to the 31st December 1915. Neither is there any detailed record of when he completed his training and posting to France. If he had completed his training by the summer of 1916 he would have experienced the heavy losses the Battalion sustained at Mametz Wood on the Somme between the 14th to 17th July. 527 officers and men were reported killed wounded and missing from the 6th Leicestershire Battalion. In late September, having been reinforced, the Battalion took further losses on the Somme at Guedecourt near Deville Wood. We know for certain that Bert Skinner was with the fully reinforced 6th Battalion at their next major engagement in the Battle of Arras. This action was timed to coincide with a French Offensive to the south near Rheims – the Nivelle Offensive. The initial phases of the Arras offensive, in early April 1917, were very successful with advances of up to three and a half miles. However, by the time Bert took to the field with his Battalion at the Third Battle of the Scarpe early successes were not repeated and ground was bitterly contested. Action at FONTAINE-LES-CROISILLES. The 6th Battalion LEICESTERSHIRE REGT was ordered to act in support to the two assaulting Battalions, 8th and 9th LEICESTERSHIRE REGT. Since the losses on the Somme the German Army had developed a strategy of defense in depth. 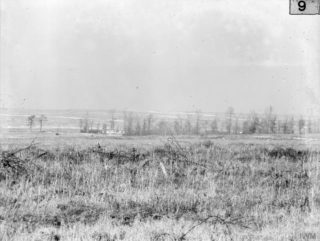 Lured on by initial success the Leicestershire Brigade, which included the 6th Battalion, were unable to hold on to German positions and the action turned into a bloody stalemate fought over over 1000 yards of no mans land. 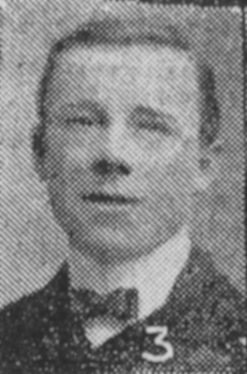 Bert Skinner’s Battalion came under heavy shelling and sustained machine gun fire. After a serious leg injury he was marooned in a shell hole for 10 hours before rescue. 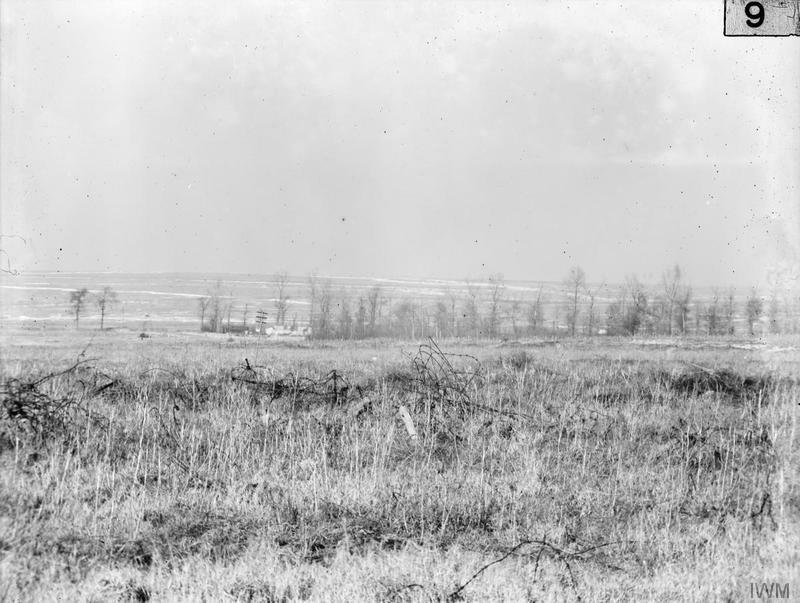 The confusion caused by the darkness; the speed with which the German artillery opened fire; the manner in which it concentrated upon the British infantry, almost neglecting the artillery; the intensity of its fire, the heaviest that many an experienced soldier had ever witnessed, seemingly unchecked by British counter-battery fire and lasting almost without slackening for fifteen hours; the readiness with which the German infantry yielded to the first assault and the energy of its counter-attack; and, it must be added, the bewilderment of the British infantry on finding itself in the open and its inability to withstand any resolute counter-attack. News was received at Bottesford by his wife that Pte. J.H.G Skinner, Leicestershires, had been badly wounded in the thigh. It has since transpired that he had received a wound from a machine-gun bullet, and had unfortunately to lie in a shell hole for ten hours before being rescued, He is now in Hospital abroad, making satisfactory progress toward recovery. Sadly his progress was not maintained despite being transported home to hospital in Stoke. The Grantham Journal for the 21st July 1917 carried news of his death on the 8th July and his military funeral in Bottesford on Friday 13th April. Bert Skinner’s short period of family life in Bottesford had made a considerable impression on community life. His work as an insurance agent for the Prudential would have brought him into contact with many in the village. A wide circle of relatives and relatives attended his funeral. The choir sang at the graveside and the Leicestershire Regiment fired three volleys. 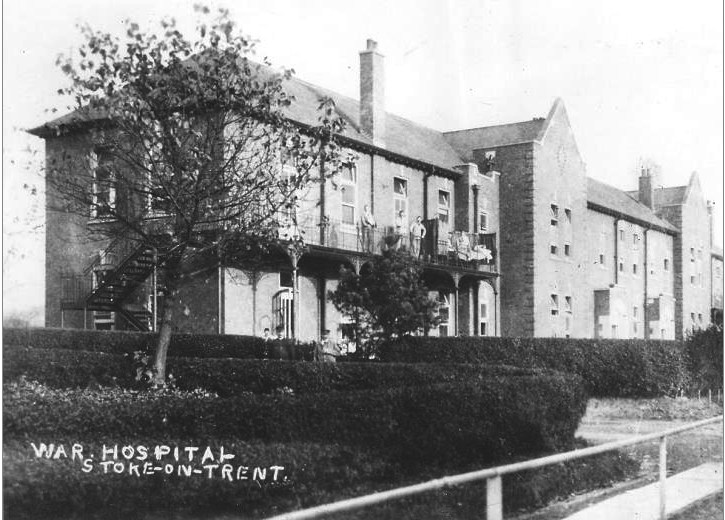 ‘Sisters and Nurses and NCOs and Men of A4 Ward, Stoke War Hospital’ also attended as did representatives of the Grantham and District Prudential Assurance Company. Bert’s brother Ernest Edward Skinner served as a Sergeant with the 2nd Battalion The Sherwood Foresters. He survived the war. Eliza Skinner lived the rest of her long life in Bottesford. 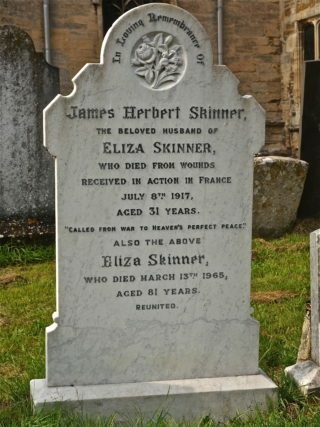 Bert and Eliza Skinner are buried together in the cemetery at St Mary’s, Bottesford. The headstone inscription simply states – ‘reunited’.